The H. Boone and Violet M. Porter Foundation has funded the Porter Fellowship to provide for a new Fellow to serve each academic year for ten successive years from 2016. The fellowship is a three-way partnership among: St. George’s College Jerusalem, St. George’s Cathedral, Berkeley Divinity School (BDS) at Yale, and the H. Boone and Violet M. Porter Foundation. 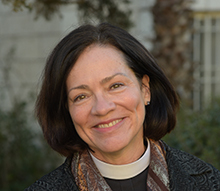 The Fellow serves in the fellowship as a missionary of The Episcopal Church, and is known as the “Porter Fellow”. The purpose of the fellowship is to advance the global leadership experience of BDS students through relationship with St. George’s College, St. George’s Cathedral, and Jerusalem Peacebuilders, a reconciliation ministry working with Israeli, Palestinian, and American teens. Della Wager Wells, the current Porter Fellow, graduated from Berkeley Divinity School at Yale with her MDiv in May 2018 and was ordained a transitional deacon in the Diocese of Rhode Island in August 2018 after serving as seminarian at Christ Episcopal Church in Westerly, Rhode Island and as pastoral associate at St. Michael’s Church in Bristol, Rhode Island. Della retired in the fall of 2015 after 30 years as a public energy finance lawyer in Atlanta to begin seminary at Yale, and is married to Jere.